There was a clash of Irish internationals in Perth, as Andy McBrine’s Midland-Guildford side played day one of their 1st grade game against Sean Terry’s Melville. Batting at 3, McBrine’s 31 runs contributed to their total of 189. Melville’s reply started poorly, with 3 of their top four going for 3 runs or fewer, but Terry (also batting at 3) steadied the ship, ending the day on 30* , and as we went to press they had reached 3-60. Terry, who announced his retirement from professional cricket earlier this year, has been in fine form for Melville, captaining their 1sts and, in his 6th game, he is now averaging 52.4. Given the retirements and injuries facing Ireland’s top order, there may be some who might like to see him revisit that decision. Also in WA 1st Grade, Stuart Thompson’s Wanneroo side restricted Willetton to 158 runs, Thompson taking 1-38 in his 11 overs. In reply, they have reached 46-1, and will be hopeful to be ahead before the game ends next week. Nathan Smith has played three games since last week’s update. He played two T20s last Sunday. Against Banktown he had one of his less successful spells (0-31 in 2 overs). He also had a run out and took one catch. His 13(12) later on, while 3rd best offering from Northern District, was not being enough stop their opponents taking the spoils on this occasion. That afternoon, they played a 2nd T20 against Paramatta, this time he had figures of 0-34 in 4 overs, took a catch, and he scored 10 of their 90 runs as they were again comfortably beaten. Today, at the longer format, he had more success. After scoring 9(18) against Blacktown, he took 2-24 in his 10 overs (and another catch) in a game that will continue next Saturday. It’s worth noting that at the longer format, his bowling average is 18.67, compared to 38 in T20. With the bat, he is averaging 30.67 in 2-day games, but 7.67 in T20. A small sample, to be sure, but he seems to relish the longer form more than the more frenetic T20 format. While it’s a shame to see him unavailable for the Wolves tour, one imagines form like this will result in him being considered for the Afghan tour. Harry Tector’s Randwick Petersham were under the kosh against Gordon in the first day of their 2nd grade game, his 15 runs contributing to a total of 175. Gordon are now 137-2, and will be hoping to finish the job next Saturday. Jacob Mulder’s South Perth faced Freemantle today in the first day of their 2nd grade game. Mulder conceded just one run in his 2 overs, and scored 5 runs in the 2nd innings. Aaron Gillespie’s Albury side played East Albury (in what I assume was a local derby! ), and he had a great all round performance. In the first innings, he took 4-37 in 6.1 overs as his opponents finished on 174-10, and he then dominated their 2nd innings total of 175-5 with 99 runs, being run out just 1 run short of his century. The second day of Ross Allen’s Centrals game vs Yallourn North saw his side end up on top. Having contributed 13 runs to their total of 220, Allen took 2-15 in his 10 overs, as the Centrals side finished proceedings on top. Graham Kennedy’s Hannan’s side played Great Boulder today. Kennedy took 2-32 in his 10 overs, as they restricted their opponents to 185-5 in their 50 overs, and he went on to score 23 runs in the 2nd innings. Niall McGovern played a T20 on Tuesday. His 14 runs as opening batsman for North Eltham Wanderers however wasn’t enough for them to prevail over Research Eltham Collegians. The same evening, Mick Cotter also played a T20 game. His 11 runs and 1 stumping contributed to a close game, with his East Keilor side falling 1 run short of the 123 scored by Glenroy in the first innings. Aaron Wright’s Merbein South side played the 1st day of their game against Coomealla Wentworth. Wright bowled 5 overs in the first innings (0-17) as their opponents finished on 231, but 3 overs into the second innings, the Merbein side had lost 2 wickets for just 4 runs. The CSNI all-rounder scored 101 in their win last week. Diarmuid Burke continues to bowl economically for Scarborough u15s. In the first day of their game against Claremont-Nedlands, his figures were 0-11 off 5 overs. Sophie McMahon played two T20s last Sunday for Gordon Women’s Blues. In the first, she took 1-15 in her 3 overs against Paramatta, and took one catch, in a game she was on the winning side, by a 102 run margin. In the second game, they played Gordon Reds, and won by 109 runs, her 2 overs going for 10 runs. And, among the final games to come in (South African time being barely ahead of ours), Shane Getkate faced his former Knights team-mate André Malan, both of whom lined out against Leinster Lightning last July in an IP50 game. In the first innings, Getkate’s 6(5) contributed to a Rondebosch total of 103 runs, with his fellow Knight (and recently announced Western Province captain) bowling 8 overs (0-19). In the second innings of a low scoring game, André Malan went for 7 (21) and his brother Pieter for 11(27), Getkate’s 2 overs going for 12 runs, as Durbanville won by 3 wickets. 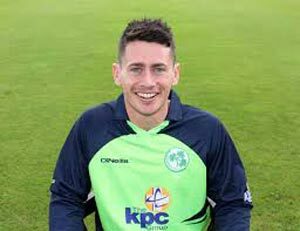 Elsewhere, as reported earlier in the week, Tyrone Kane has returned to Dublin as a precautionary measure following an injury that had restricted him to batting, and also back in Ireland is James McCollum, who will be one of eight batsmen attending batting camp in Bangalore later this month. Again, if there are any performances we missed (or any errors reported! ), any information gratefully received, I can be DMed on Twitter @dotski_w.